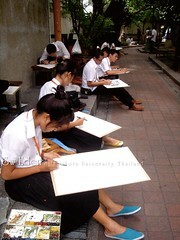 Silpakorn University is really welknown about art, decoration, interia design and architecture. On the floor and on the wall are full of artwork. Right now they are drawing in "Saun Geaw" (Glass Flower Garden). This garden is small and have many fragrance tree. Also the sculpture from the student in this school. This is the place for artists. And It has the art store with cheapest prize, I have met.